ASHEVILLE, NC – Railfest 2009, a Great Smoky Mountains Railroad festival, will return to the Bryson City Depot, September 18th through 20th. This three day gathering for railroad enthusiasts and history buffs from around the world provides an opportunity to ride special excursions, see railroad memorabilia and experience music of the rails. Thousands return each year along with first time visitors to enjoy a taste of railroad food, storytelling, dancing, live music, special excursions and events unavailable any other time of the year. The 28th Annual Fireman’s Day highlights Railfest on Saturday. Festivities will include rides on the 1939 Dodge American La France Fire Truck, the Firecracker 5-K Run, All-Male Miss Flame Beauty Pageant, and their famous Bar-b-que. Remember to purchase a Bryson City Firemen’s Tee Shirt. Saturday festivities include special train rides, motorcars on display, seventh annual mountain craft fair with over fifty vendors, a children’s talent contest along with the winner’s jamboree, and a bouncy train for children to enjoy. The popular Great Smoky Mountains Railroad Depot Band will be the headliner of the event’s musical entertainment. Sunday features a Nantahala Gorge “Photo Special” Excursion. This eight-hour roundtrip excursion takes passengers from Bryson City to Andrews, and includes two photo run-by opportunities, as well as a picnic lunch. Visitors to Bryson City will enjoy gospel music throughout the day. For more information and reservations please call 800-872-4681 or visit us online at www.GSMR.com. 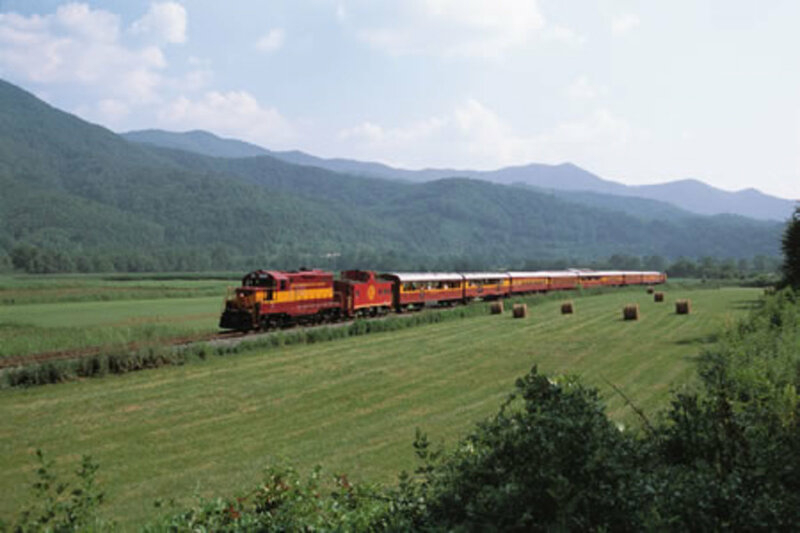 ASHEVILLE, NC – The Great Smoky Mountains Railroad presents dinner theatre – on rail. The Mystery Theatre Dinner Train puts passengers in the midst of suspense and intrigue. Passengers participate in solving the "mystery" presented by Nightshade Mystery Theatre, a professional group of actors from Asheville, NC lead by local theatre veteran Deborah Austin. Passengers board the train in Bryson City, NC for a three-course gourmet prime rib dinner. Seating is in one of three elegant, restored dining cars. The meal is prepared by the talented Deborah Douthit. Dinner includes Prime Rib of Beef tastefully complimented with Au jus and horseradish sauce, Caesar salad, Fire Roasted Vegetables, Marble Cheese Cake, and tea or coffee. A vegetarian selection of a Portabella Mushroom Tower is available upon request. Cocktail and wine service is available for purchase on board the train. May 16, 23, 30 – RIGHT UNDER THE DEVIL’S NOSE brings together modern day treasure hunters to mount an expedition to Lake Titimama. Is fearless leader Johnny Lonne another Indiana Jones, or is he the con artist of the century? All the investors in the audience must find the answer to solve a mystery. June 6,13, 20, 27 – A FINAL HOMECOMING features a mysterious gem mine, an amazing tattoo, and a scheme to develop the mountain ridges – just some of the secrets spilled when the Higbee Clan meet the real estate developer. Who’s going to buy the farm? July 4, 11,18, 25 – MY FATAL VALENTINE by Eileen Moushey, returns as Heartthrob Books brings its most popular romance novelists together to compete for the coveted Love Knot Award. Hilarious readings from the nominated works and then the publishers are one writer down. Was it a poisoned pen? August 1, 8, 15, 22, 29 – A NEW MYSTERY premieres on the Great Smoky Mountains Railroad with colorful characters, a story filled with twists and turns, and the promise of an evening of laughs. Train cars become detective agencies as guests question suspects and solve a mystery. September 5,12,19,26 – IMPORTED SPIRITS is set at the 1922 convention of SSPAM, Society of Supernaturalists, Psychics, & American Mentalists, but moonshiners have seized upon this meeting to spirit their spirits out of town. A hilarious romp with séances, secret recipes, and white lighting. All Mystery Theatre Dining Trains operate ever Saturday evening with 7 PM departures and run May 16- September 26, 2009. For more information and reservations please call 800-872-4681 or visit us online at www.GSMR.com. BRYSON CITY, NC – America’s favorite legend brings law and order to the mountains of western North Carolina at the Great Smoky Mountains Railroad this May and August. The four weekend special event will take place May 23-24 & 30-31 and August 22-23 & 29-30, 2009 at the Great Smoky Mountain Railroad’s Bryson City Depot. During the ride, The Lone Ranger and his faithful companion Tonto will save the train from outlaws who intend to rob the baggage car that is carrying a shipment of gold! This year marks the 75th Anniversary of The Lone Ranger. Come meet the masked rider and Tonto, experiencing a full day of fun! There will be an array of cowboy and western activities at the depot for people of all ages. Enjoy live musical entertainment, old west cowboy roping demonstrations, games, original episodes of The Lone Ranger playing in the theatre, a Lone Ranger look-a-like contest and much more! Advance tickets are recommended, as seating is limited. Adult tickets are $49.00 and children two and up are $29.00. For more information and reservations please call 800-872-4681 or WWW.GSMR.COM. Proud member of the American Heritage Railways family. Visit our sister railroads in southwest Colorado at the Durango & Silverton Narrow Gauge Railroad and in east Texas at the Texas State Railroad. BRYSON CITY, NC – The Great Smoky Mountains Railroad is pleased to announce our Peanuts™ Easter Beagle Express on Friday, April 10th, and Saturday, April 11th, 2009. Trains will depart the historic Bryson City depot at 10:30am. The train will travel along the Tuckasegee River, cross over the Fontana Lake Trestle and into the Nantahala River Gorge for a 4 ½ hour journey. Celebrate springtime aboard this festive Holiday event. Passengers will join Snoopy, Lucy, Charlie Brown and our Easter Bunnies for old fashioned Easter fun during the 1 hour layover at the Nantahala Outdoor Center. Festivities include an Easter egg hunt with special prizes, egg decorating, storytelling, coloring sheets, temporary tattoos, snacks with Snoopy and more. There will also be plenty of opportunities for pictures, so do not forget your camera! Advance tickets are required, as seating is limited. Adult tickets are $ 49.00 and children two and up are $29.00. Limited Crown Coach upgrades are available. You are currently browsing the archives for the Bryson City category.